Yesterday, I came up for air after falling into a Trump/Clinton news coverage hole where I’d lain for several days alternating between stunned staring at the television and borderline hysterical laughter long enough to spend a couple of hours reading. Since the last book I read was basically over my head, I decided to go for a more straightforward detective story. Sun And Shadow by Ake Edwardson came up via a spin on Random.org so I lay down on the sofa ready for a night’s reading. 50 pages later, still no corpse. I am of the school that a detective story/murder mystery should begin with the discovery of at least one corpse on page one. Very few writers meet this standard so I have to allow a chapter or two for various subplots to be established. But 50 pages, that’s more than enough. So I put Sun and Shadow in the bag for the Friends of the Library book sale and moved on to the next two books in my Tournament of Short Stories II pile: The Dream LIfe of Astronauts by Patrick Ryan and Tales of Conjure and The Color Line by Charles Waddell Chesnutt. Charles Chesnutt came to my attention this summer at a Gilder Lehrman seminar I attended on Literature of the Jim Crow Period. Charles Chesnutt was an African-American writer of the late 19th/early 20th century who tried to write for a white readership as a way to educate whites about Jim Crow. We read his most successful novel, The Marrow of Tradition which I recommend as a historical document but not so much as a piece of literature. Last week, I found an anthology of Mr. Chesnutt’s short stories at Beers Books in Sacramento for $.75 cents. The first two stories in Tales of the Conjure and The Color Line feature the same set of framing characters. A northern white man who has purchased an old plantation in North Carolina and the black man who has lived on said plantation his entire life. The black man, Julius McAdoo, tells the new plantation owner and his wife tales of the old days when slaves believed in conjuring, a folk magic practiced by slaves largely against and for other slaves. The stories are similar to things you’ll find in Mark Twain’s accounts of life in the Antebellum South, told in dialect which was considered one of Mr. Chesnutt’s strong suits. I found them both to be uncomfortable reading yesterday. Julius is called “Uncle Julius.” He seems to feel that black folks should know their place and are better off staying in it. When he tells of a slave whose wife is sold off while he is away, Julius plays the scene for its humor instead of its pathos. The framing story feels too close to Uncle Remus’ Tales. I’m not sure what to make of this since these stories were written by a black man at a time when he would have known former slaves. In one story, “The Goophered Grapevine,” a plantation owner has a spell put on his vineyards so that any black person who drinks liquor made from his grapes will become physically sick to nearly the point of death. This stops all of the slaves from using his grapes to make wine. I thought this story would include scenes of a “white” person becoming sick from the wine which would reveal he was actually black. Mr. Chesnutt, who could easily pass as white himself, did not go there with his story much to my disappointmet. 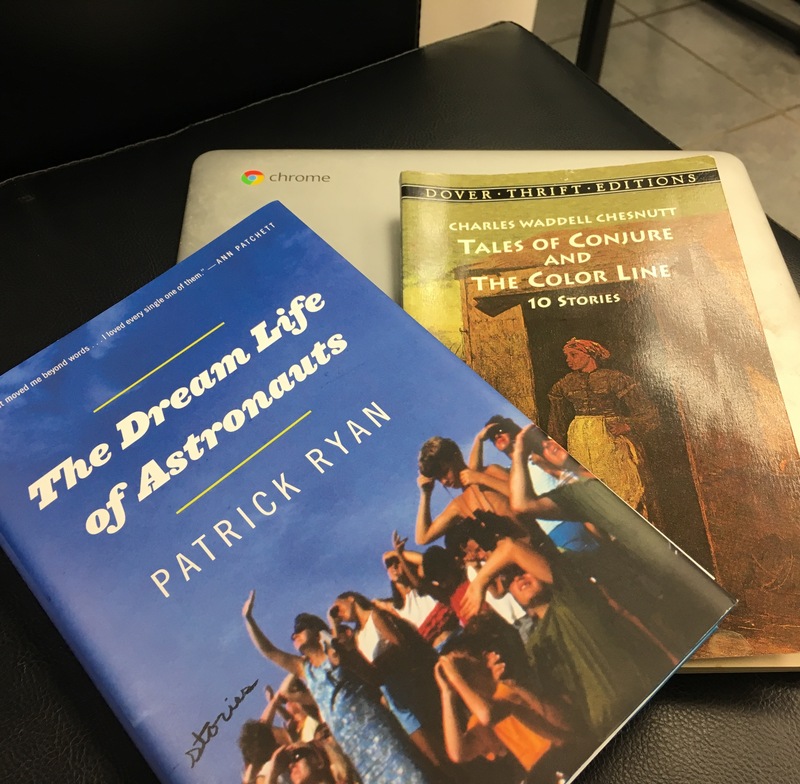 So this round should be an easy win for Patrick Ryan, a writer I have admired for many years now, but the two stories I read yesterday were not as strong as the first two in his new anthology The Dream Life of Astronauts. The two I read yesterday, “The Fall Guy” and “Summer of 69,” are both good stories, both well-written, both full of believable, compelling characters. Character is probably what Mr. Ryan does best. Though it’s been several years since read two of his three YA novels and his previous collection of short stories, I still remember his characters, still think about them now and then. I still kind of hope they are all doing well the way you do with people you used to work with but haven’t seen or heard from in many years. But the two I read yesterday just didn’t satisfy at the same level the first two stories in The Dream Life of Astronauts did for some reason. “The Fall Guy” was nearly ruined for me by a twist ending scene that struck me as too much of a jump when one character showed up drunk and said something incredibly mean to one of the young protagonists. Though I’m not sure I can call any one character in that story the protagonist. It may be that Mr. Ryan’s stories are just too morally complicated to be the sort of easy reading I was looking for last night. Detective stories, even at their most morally ambivalent, lead to a clear conclusion on some level. A killer is caught. Someone is held to account. Even if neither of these things happen, the reader is lead to understand what should have happened in a morally just universe. Mr. Ryan’s stories didn’t provide that satisfaction yesterday. They did provide solid writing, compelling situations, and a couple of very memorable characters. As much as I was disappointed in the ending of “The Fall Guy” I’m still thinking about it, still bothered by it. It was a bit like the way Robert Cormier used to end his novels, in ways that made the reader mad enough to through the book against the wall which were also ways that made the book stay with you for life. If you’ve read The Chocolate War, you know what I mean. So, I’m advancing Patrick Ryan to the next round in the tournament. The story by the African American man reminded me of the writings of Booker T. Washington, who wrote about how good times were for him when he lived on a plantation. These were memoirs/essays, NOT fiction. It’s entirely possible that the writer wanted to let the white community know he was “cool” and not one of the “trouble making” black men who was making things “hard” for good Christian folks.